The traditional nine months of toil lies in wait as the Cobblers bid to show they are one of the best, in Sky Bet League Two at least. Manager Chris Wilder has assembled his troops for what he hopes will be a successful promotion push. Following last season’s plethora of peaks and troughs, the Town faithful will hope for a more consistent campaign this time round. One that has plenty of thrills and far less spills than the last. Tasked with ensuring that ambition becomes reality are a group of players who showed flashes of excellence last term. They won at Shrewsbury, who eventually finished second last season, and also displayed their capabilities against a number of other sides. 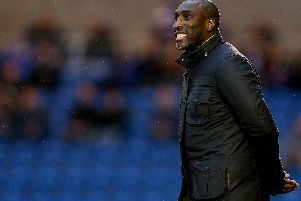 Wilder’s men followed a run of two wins in 14 league games with a hot streak of five consecutive wins, catapulting them back into the promotion picture. They were to fall short, finishing the season in 12th, 10 points adrift of the top seven, but the redemptive run gave them hope for the forthcoming campaign. The manager has added astutely to his squad, with extra threat posed by the likes of Nicky Adams and Alfie Potter during pre-season. But the spotlight will remain on events at the other end of the pitch, where Cobblers proved to be particularly porous during the previous campaign. “It’s no coincidence that clubs that win promotion and do well throughout all divisions have a solid base and a solid foundation from the back,” said centre-back Ryan Cresswell. The robust Cresswell chipped in with five goals in 32 league appearances last season. But the former Fleetwood man knows that is not what he should be judged on. “Clean-sheets are the first and foremost target for any defender, it’s the main thing and we’ll set a target for that,” he said. “Hopefully we’ll get to that target, achieve it and then move forward from that. First up for the Cobblers and Cresswell is a trip to newly-promoted Bristol Rovers on Saturday. And with the gap between the non-league and those in league two seemingly narrowing all the time, the task will not be an easy one. “Bristol Rovers’ confidence levels will be really high,” Cresswell said. “They’ve got a winning mentality from gaining promotion last season and they’ll want to take that into the early games of the season. Cobblers have undergone the standard pre-season tests, passing the majority of them. And Cresswell knows that results like the 2-2 draw against Birmingham City and victories against the likes of Brackley Town and Sheffield FC were useful boosts. “Personally pre-season’s gone really well,” he said. “I’ve worked every day and I’ve enjoyed it. “From a team’s point of view we’re looking well, we’ve taken each game as it’s come and the lads are looking fit and ready for the start of the season. “If you work hard you’ll get the rewards and if you don’t then you’ll suffer. Now Cobblers will have to put those hard yards in again and again as they look to grace the top seven this season. And if Cresswell’s confident manner is anything to go by they have every chance of doing just that.